1. Using a little water in a frying pan (instead of oil) cook the peppers, garlic and onions. 2. Remove from heat and add the remaining ingredients (including the cooked McCain Chef Solutions Simply Wedges and ¾ of the cheese). Gently mix ensuring that all ingredients remain intact. Return to the heat for five minutes to cook. 3. Divide mixture between the wraps and roll/fold neatly. 4. Place in an ovenproof dish and sprinkle with the remaining cheese. 5. Cook gently at 180˚c for 3-5 minutes or until the cheese is melted and serve. 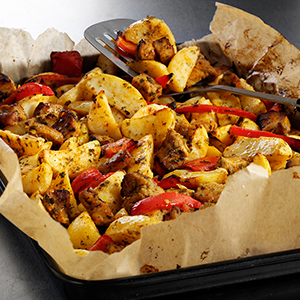 Serving Suggestion: Barbecue wrap, mixed salad, McCain Chef Solutions Simply Wedges.